I really wish I had some before photos of this yard. Just to give you a picture of what it was like, imagine a yard overgrown with weeds, a fence that was falling apart, a semi-dead lawn and a garage that was painted off yellow with paint peeling off of it. It was a disaster yard to say the least! Before the new yard - As with all of my designs, I got to know the personality of the client by walking through their home and observing things like decor, paint colors on the walls, tapestries and other clues. For this particular client, one theme resurfaced throughout the home, Japan. This client had a kimono hanging on the wall as well as a couple of Samurai swords and alters like you'd see in Japan. Japanese artwork and travel photos were prominent. It seemed to me that if there were ever an appropriate time to do a traditional Japanese yard that this was it. I was ecstatic! Having been to Japan years ago, I was heavily influenced by what I saw there. The architecture and designs styles all seemed to mimic nature to a degree. It's the element of simplicity coupled with sophisticated details that I admired so much. The Japanese House Structure - So, let me go into the details that went into this project. First thing first, pretty much everything needed to come out in order to create a clean slate! I decided to take an eyesore of a yellow garage and turn it into a traditional Japanese looking structure. The process was quite simple, yet with a dramatic result. After sanding the structure down, we painted it a rich slate color for the base coat. We hand painted all of the details after that. I installed 4 X 8" diameter post at the corners to give it that lodgepole construction look that you find so much throughout Japan. I had crafted some sweeping eve extensions and painted those red. 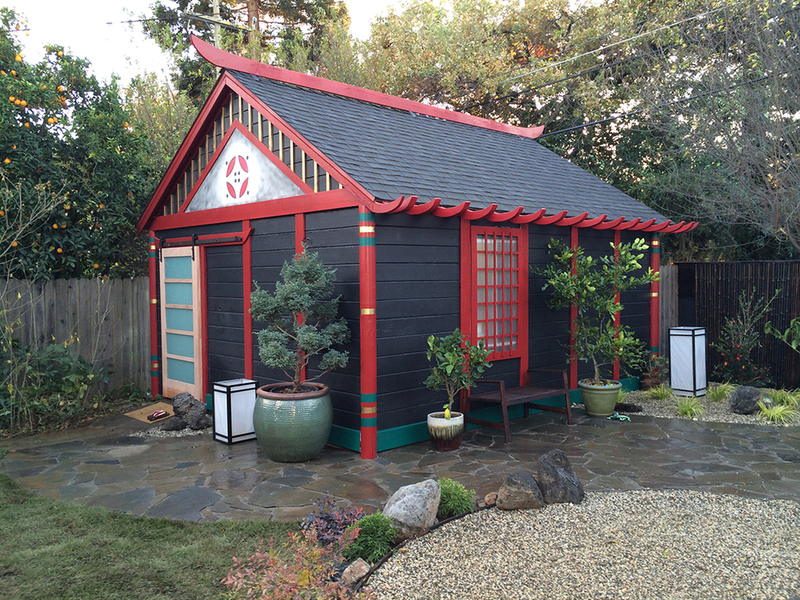 We installed a decorative ridge at the top of the roof and installed a Shoji screen windows and sliding door. When it was all said and done, you couldn't even tell that it once was an old dilapidated garage. The Kotatsu Table - This is a table that has its origins in Japanese antiquity and is still in wide use today. As one sits at this table, the burner at it's center warms the legs and feet. I wanted to make this table into grill as well a shrine onto the Sake Gods :). I wanted to make sure that the color scheme and building details of the table, shrine and structure all matched. The Bamboo Fence - I believe that fences can either make or break a yard. After all, it's one of the first things you see when you walk into a yard. This is because fences are vertical and at eye level most of the time. I simply couldn't leave the fence as a non-impressive standard 'dog ear' design. This is where the bamboo came into play. I ordered the awesome looking mahogany colored bamboo fencing from Cali Bamboo (http://www.calibamboo.com). It's not that cheap stuff that you get at your local home improvement store. This stuff is heavy duty and super durable. After repairing the original fencing, we simply tacked the bamboo screen over the existing fence. We installed a 2"x6" cap to frame it in and then Joel (my brother) hand painted these amazing crane panels to flank either side of the Kotatsu table. Certainly, no Japanese designed yard is complete without a Zen Garden. These gardens were originally conceived to mimic what we see in the natural world. The boulders seem to represent the mountains and the gravels, the sands and openness of the ocean. This really ended up being the place where on could truly "Zen Out" and get down with nature or perhaps recover from a hangover due to drinking too much sake the night before :) As for the landscaping, we went very traditional, using mugo pines and other ornamental grasses. As a summary, it's not often that you get a client that wants something so specific and so outside of the American norm. I'm extremely grateful to have had the opportunity to work on this project and with such an awesome client!